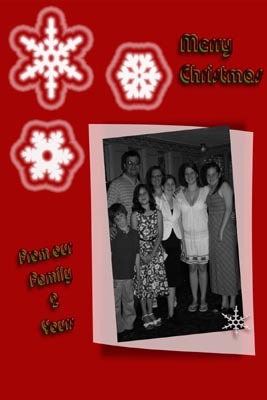 With Christmas just around the corner, I thought we could learn about digital scrapbooking with layers using a Christmas theme. I have designed a simple 8 inch by 8 inch layout that includes one picture. Any of the layers can be resized, along with the overall size. Because of the simplicity, this would also make an excellent holiday card. All images and layouts are designed using Adobe Photoshop CS3 ; although, digital scrapbooking pages can be produced using other graphics programs such as Paint Shop Pro Photo X2 , Adobe Photoshop Elements 6 and many others. The steps that I will be discussing assume you know some of the basics, such as creating a new document according to the size/colors you desire; along with knowing where each tool is located within Photoshop. First create a new document to the size that you desire; for this one we will be using a typical 8 inch by 8 inch layout/background as stated previously. This of course becomes its own layer. Each of the three snowflakes in the upper left of the background are made using the custom shape tool then applying an outer glow style from the blending options window; layer 2. The snowflake in the lower right corner is made by also using custom shapes>blending options>drop shadow (right click on this layer style and select ‘create layer’, which in turn makes the drop shadow its own layer) that is warped using Edit>transform>warp. Reselect the snowflake and go through the blending options again blending options>bevel/emboss>color overlay>satin. All of these options can be manipulated for what you prefer. The paper piece under the picture is made by using the rectangle tool>color fill with white>changing the opacity and the fill from 100% to a percentage you desire. When using the blending option>drop shadow (do the same process as the above drop shadow), make sure that you change the opacity and shape using Edit>transform>warp to make it look as realistic as possible; taking note of how the light would be shining onto the paper. To achieve the metallic green/red look of “Merry Christmas” and “From our family 2 yours”; I first, of course, typed out the words I wanted to use. Then, using the blending options tool, chose a style I liked. In this case I used the shiny blue metal style and changed the colors until I received the desired look. The majority of this process is trial and error to achieve the look you want. Sometimes you are going to think you want one look, then when it is completed; you are still not satisfied. In this case, you just keep trying. Once you have an effect you really like, save it with a name that suits the effect. If you are not familiar with the option of saving your newly made style, all you need to do is make sure your style/blend options window is open and the layer that has that particular style is selected. With the style/blending options window open, look on the right hand side of the window and you will see a button new style. Select that button, name the style whatever you like, hit okay and it is now saved within that styles menu. 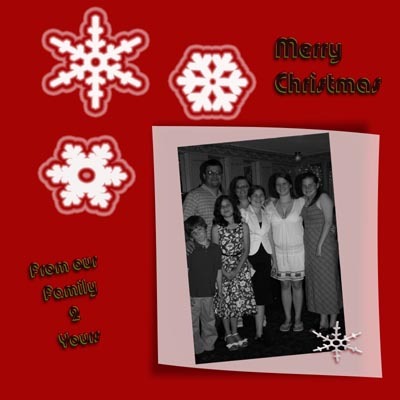 I have included the resized version to show how the 4x6 Christmas digital scrapbooking card would appear. This size card is very popular with friends and family for the holidays.